FAST FOOD CHAIN McDonald’s has said it has no plans to introduce zero hours contracts in Ireland, after its UK workers were offered the chance to switch from the controversial practice to fixed-hours earlier this week. On Wednesday, McDonald’s announced that it would offer 115,000 of its UK workers on the contracts the opportunity to move to fixed contracts with a minimum number of guaranteed hours every week. Its chief executive in the UK, Paul Pomroy, said that “the vast majority” of employees were “happy with their flexible contracts, but some have told [them] more fixed hours would help them get better access to some financial products”. Pomroy previously told the BBC that a large proportion of workers were happy to remain on these “flexible contracts” rather than move to fixed contracts. 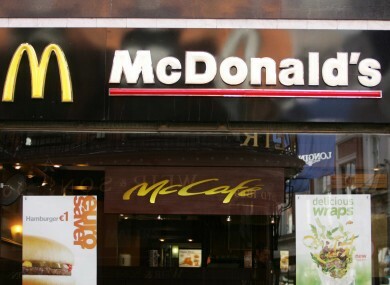 Speaking to TheJournal.ie, a spokesperson for McDonald’s in Ireland said the company “does not operate on a zero hours employment contractual basis”. We have no plans to introduce this practice. Other companies under pressure for the practice in the UK include Sports Direct, who were forced into a similar climbdown last year after political pressure. These kinds of contracts have proved particularly unpopular in the UK, with critics saying that companies used them to exploit workers through its ability to change shifts at short notice. The UK government has shown little appetite to change this, although Labour leader Jeremy Corbyn has pledged to ban the practice if elected Prime Minister in the upcoming election. Zero-hours contracts are rare in Ireland (and there is some protection under a 1997 Act), but a government report in 2015 found that the percentage of workers on “if and when” contracts, or on low-hours contracts, is increasing. While zero hours contracts are essentially not possible in Ireland, employers are able to get around this by offering these “if and when” contracts. “If and when” contracts are effectively zero hours contracts, except without the obligation on the worker to make themselves available for work. Writing in TheJournal.ie, solicitor Jason O’Sullivan said it would be key for this government “to quickly stem the growth of “if and when” contracts”. In response to a question on the issue last month in the Dáil, Minister for Employment and Small Business Pat Breen said that he and his colleague Minister Mary Mitchell O’Connor “intend to bring forward proposals in this area for consideration by government”. “We intend to include protections aimed particularly at low-paid, more vulnerable workers,” he said. Our proposals will address the issue of employees on low hour contracts who consistently work more hours each week but whose contracts do not reflect the reality of their hours worked. He did add however, that developing policy in this area is a “complex matter”. So, what do you think? Should the government legislate and ban zero hours contracts in Ireland? Email “'No plans for zero hours contracts' for McDonalds in Ireland after UK u-turn”. Feedback on “'No plans for zero hours contracts' for McDonalds in Ireland after UK u-turn”.